Go birdwatching with a Birdingpal from Thailand. I am a British expat, a retired public servant from Nottingham, who lives in upper Thailand about 12km North of Phetchabun City which is 350km North of Bangkok, at the side of highway 21. I have lived here for around 5 years. I enjoy looking at birds but my main passion is bird photography, I am not a twitcher or birder who is just interested in ticking off a species from the Thailand list. Any pals thinking of contacting me need to be aware that were I live is not on the normal tourist trail. You really need to travel independently by car to get here, although there is an express bus service from Bangkok to Phetchabun. The best time to visit me is between November and March, when, generally speaking the weather is cooler, with clear skies and little or no rain. I only support pals who visit my area I do not travel to other areas of Thailand. 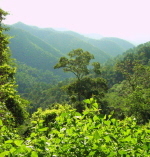 The area is part of the flood plain of the Pa Sak River, a rice growing area sandwiched between the Phetchabun Mountains, Nam Nao to the East and Khao Kho to the West. 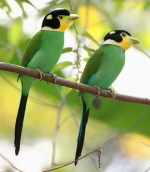 Thailand has over 1000 species of birds including winter migrants. In my area you would expect to see a good range of common Thai birds. The two national parks I visit host some less common birds, in Nam Nao for example I have recorded 8 species of woodpecker, it's also a great place to see the Red-billed Blue Magpie up close.. While in Tat Mok there are a range of Barbets, lot's of raptors like the Crested Serpent Eagle and a whole host of forest dwelling birds. I'm 45 and more into bird photography than watching. Still learning about Thai birds, I have done ornithological work in a number of countries and am currently studying a number of mammal species post-doctorally at Prince of Songkla University-Hat Yai. "The magic place for bird watching," for here is wonderful place to see many specie bird come to take a bath drinking and feeding. Created by local people in the village. People live around the forest park they had to be hunter before make a farm. They knew well about the trail of mammal and bird living around his area, he made a small pond like a trap and build 2-3 hind for people hide inside with camera! In every day farmer fill a fresh water 15 liter (pool size wide 3 foot - long 4 foot – water deep 4 inch) and leave some fruits for bird and mammal eat. Bird start to active on 07:00 – 17:00 if a day the weather around 30 C. or sunshine no cloudy, bird much more active at small pool for take a bath. Since 2008, the first pond build by Uncle Sin, his pond show a lot of bird live around here more 35 specie per day such as Bar-backed Partridge, Scaly-breasted Partridge, Kalij Pheasant, Red Junglefowl, Crested Goshawk, Red- legged Crake, Grey-headed Woodpecker, Eared Pitta, Emerald Dove, White-browned Scimitar-Babbler, Large Scimitar-babbler, Black-crested Bulbul, Black-headed Bulbul, Stripe-throated Bulbul, Green Magpie, Lesser and Geater Necklaced Laughingthrush, Brown-cheeked Fulvetta, Siberian Blue Robin, White-rumped Shama, Tickell’s Blue Flycatcher, etc. And also small mammal such as Greater Mouth Deer, Squirrels. Photo by Phil photographer from Malaysia, he’s in hide! The small pool located out side Kaeng Krachan by the forest edge, now around here also have 8 small pool but not every one successful bird come for show. if you want to go, for birding or bird photography, please contact us before booking tour because we don’t put program it’s here in every itinerary and we will need to check information before take you there. Hello Par, We enjoyed the trip very much. No complaint from anyone. Steven like your company service better than from the other company...so He want to go again in December with BirdEco. Do not worry ...we are only 50% birder...So saw so many lifer in this trip and is very happy. I think altogether he spotted about 25 lifers. Steven (sharkspin) got his Indian Roller/Green Bee-eater and Hoopoe....and he have good food so he is very happy. Me? I got many action shot of Gulls and terns in breeding plumage. Also got the Green Bee-eater nest...so I am happy. Coral-billed Ground Cuckoo, Bar-backed Partridge, Scaly-breasted Partridge, Kalij Pheasant, Red Junglefowl, Crested Goshawk, Red- legged Crake, Grey-headed Woodpecker, Eared Pitta, Emerald Dove, White-browned Scimitar-Babbler, Large Scimitar-babbler, Black-crested Bulbul, Black-headed Bulbul, Stripe-throated Bulbul, Green Magpie, Lesser and Geater Necklaced Laughingthrush, Brown-cheeked Fulvetta, Siberian Blue Robin, White-rumped Shama, Tickell’s Blue Flycatcher, etc. And also small mammal such as Greater Mouth Deer, Squirrels.